I remember, as a child, watching “Father Knows Best.” Now, much older and a father myself, I hope to be a guide to my children just as Mr. Anderson was on the show. However, just like children, we all go astray. Often we forget or just do not want to recognize who is really in charge. When this happens, our entire world individually and corporately comes totally off the rails. Job, through no fault of his own, found himself in dire straits. His friends came to comfort him, but seemed to pile on more sorrow than help. 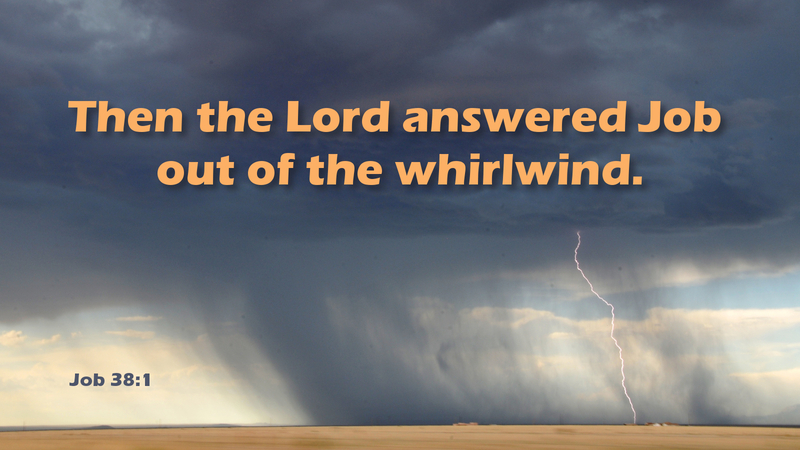 Suddenly out of the whirlwind God let Job and his friends know who is truly in charge. Often life feels like a whirlwind hurling turmoil after trouble our way. Many times it seems as though God is a million miles away. It is at these moments that the cry of Jesus on the cross, “My God, my God, why have you forsaken me?” takes on special meaning. The Father was there and he stands with each of us also at our lowest points. Prayer: Father, come to our aid at moments of trouble, reminding us of your constant presence. Amen.